Brief Description: The 2012 OPHI-HDCA two-week training course on Capability and Multidimensional Poverty held in Jakarta, Indonesia, brought together a vibrant mix of people to learn about multidimensional poverty measurement and the capability approach, and provided an introduction on how to implement a national or organisational Multidimensional Poverty Index (MPI). The purpose of this intensive summer school was to provide a thorough conceptual and technical introduction to techniques of measuring multidimensional poverty, drawing on the capability approach, with a strong emphasis on the Alkire Foster method. It was led by the researchers and director of OPHI. 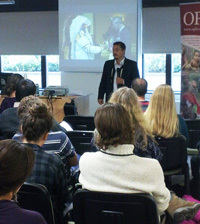 Shawn A-in-chut Atleo, National Chief of the Assembly of First Nations, Canada, gave a talk to a packed room at Queen Elizabeth House, University of Oxford on 9 October 2013. National Chief Atleo talked about the priority issues facing Indigenous nations in Canada, from education to resource development and the enduring requirement for recognition and affirmation of relationships to achieve fairness, justice and harmony. You can listen to a podcast of his speech here. His speech was followed by a talk by a former National Chief of the Assembly of First Nations, Ovide Mercredi, who during his time in office addressed the UN in both New York and Geneva. You can listen to a podcast of former National Chief Mercredi’s talk here. The National Chief is elected by the 633 First Nations governments in Canada and serves as a national and international advocate for the rights of Indigenous Nations and peoples. October 2013 marks the 250th anniversary of the Royal Proclamation issued by King George III addressing the matter of Indigenous peoples and the requirement to establish Treaty relations. The seminar was held as part of OPHI’s work on Social Isolation, part of our research into the Missing Dimensions of poverty. For more information, please contact researcher China Mills at china.mills@qeh.ox.ac.uk. At a stimulating side-event at the UN on 24th September 2013 the governments of Colombia, Mexico, Chile, Philippines and Nigeria, along with the World Bank, UNDP and OECD, all called upon the UN to adopt a new multidimensional poverty measure, the MPI2015+, to track progress toward the new goals adopted after 2015. Some of the highlights from the discussion are provided here, and a full video of the discussions is also available. She stressed the importance of multidimensional measurement in the context of post-2015 development debates: “Multidimensional measurement is not only relevant within the framework of the current MDGs but it is particularly important as a topic for a future framework also and set of goals we will be discussing until 2015”. 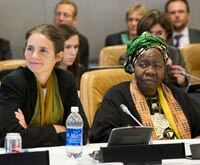 Sabina Alkire, Director of OPHI, then underlined the need for a multidimensional approach with research showing the lack of correlation between reductions in $1.25/day poverty and reductions in non-monetary MDG indicators such as child mortality, school attendance or access to clean water. She showed how a Multidimensional Poverty Index (MPI) can zoom in on the lived experience of poverty like a high-resolution lens, showing who is poor – which social groups and in which regions – and how they are poor: which deprivations batter their lives. By shedding light on the inequalities among poor people, a national or regional MPI enables policymakers to target the most marginalised and vulnerable, to ensure that no one is left behind. An MPI 2015+ supported by better quality, more regular data could be used to track progress towards nationally defined goals. “…we acknowledge that income poverty does not capture all the complex dimensions of poverty and that if public policy were exclusively driven by traditional income poverty measures resources could easily be misallocated. Therefore we recognise the importance of a complimentary approach, just as OPHI’s Multidimensional Poverty Index, to design public policies that result in effective implementation”. Gonzalo Hernandez, Executive Director of the National Council for the Evaluation of Social Development Policy (CONEVAL) Mexico, described how his country’s innovative adoption of a multidimensional poverty measure in 2009, which includes a social rights approach, measuring access to health, housing, education and access to food, as well as income, has enabled public policy to focus on those who are hardest to reach. He stressed that post-2015 national multidimensional poverty measurement needs to accelerate following the examples of countries such as Mexico, Colombia, El Salvador, Moroco, Chile and the state of Minas Gerais in Brazil. He also said a global measure of multidimensional poverty is required and that better data is needed, stressing that “the rush on poverty needs much more than good will and guesses”. “As all of us know the MDGs number 8 in all and these are internationally translated into 48 indicators… we have been reporting on our progress for each indicator almost as if they are unrelated. I would not even be surprised if our strategies towards MDGs follow a silo approach, in fact we may have even encouraged this practice by not specifying a multidimensional poverty target”. “As far as Nigeria is concerned, this is an excellent initiative, and I’d like to encourage all represented governments here to take a critical look at the MPI and the parameters by which it defines poverty in an effort to orientate our thinking,” Kale stressed. Paula Caballero Director of Economic, Social and Environmental Affairs, Colombia said that in order for us to eradicate poverty in an irreversible way, we cannot do it through income alone, we also need a multidimensional approach. She spoke of Colombia’s Multidimensional Poverty Index which tracks and monitors a variety of social and economic variables, beyond income, and shapes the government’s social programmes and interventions. She also stressed the importance of taking a structural integrated look at what development means and what is necessary to eradicate it. Finally, she echoed calls for a new MPI2015+: “We are convinced of the need to apply this kind of approach at the global level and believe that a new global MPI post-2015 would be a complement to the other work that’s ongoing”. Hildegard Lingnau spoke on behalf of Erik Solheim, Chair, Development Assistance Committee, OECD and said that “Poverty is more than just income poverty and income inequality. The big challenge today is to identify and combat the multidimensional poverty, the many poverties, deprivations and inequalities in many regards”. Olav Kjorven, Assistant Secretary General, UNDP, used his speech to reiterate UNDP’s commitment to strengthening national and global measures of multidimensional poverty and their links to the post-2015 agenda. He also called for a Data Revolution to build on the world’s work on tracking the MDGs and 2015 preparations, such as the World We Want report which involved over one million people around the globe. He concluded by saying “Let’s continue to work together to measure multidimensional poverty and in so doing help eradicate poverty once and for all”. John Hammock, who was chairing the event, recognised the presence of Alexander Segovia, Technical Secretary of the Presidency of El Salvador, who is leading the effort to establish a national MPI in his country. Full video of the discussion is available, along with a briefing paper about why a multidimensional poverty index such as the MPI2015+ is needed. Detailed event information is also available. 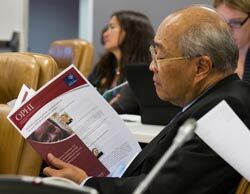 The Multidimensional Poverty Peer Network held a special side-event to coincide with the High Level Meetings of the 68th Session of the UN General Assembly. The event addressed the future of multidimensional poverty measurement in the context of the post-2015 development agenda. * Recommended that the UN should adopt a new multidimensional poverty measure to complement the $1.25 a day income poverty measure, and urged the UN to adopt a new multidimensional framework for poverty reduction worldwide, as part of the post-2015 development strategy. * Called for the breaking apart of silos on poverty reduction, and for countries and international institutions to adopt a multidimensional, multisectoral approach to poverty reduction underpinned by multidimensional poverty measures. * Shared concrete ways in which national MPIs, whose indicators reflect national plans and country priorities, are being used for policy coordination, targeting, monitoring, and making visible real progress that income poverty measures overlook. * Were united in their calls for better data and better measures of poverty. At the national level, the governments of Colombia, Mexico, the Philippines, Nigeria and Chile called on other nations to embrace new multidimensional poverty measures due to their effectiveness for policy change. They stressed that it is essential to complement any international MPI with nationally adapted indices for poverty reduction. Their calls highlighted the pioneering work being undertaken by Southern nations on global poverty eradication, and the importance of South-South learning in driving change and innovation. The video of the event can be accessed via the link here. Highlights of some of the discussion’s key points are available on the OPHI website here. You can view Sabina Alkire’s presentation on building a multidimensional poverty index here. To read a Guardian report on the meeting, visit their website here. To read the statement given by Arsenio M. Balisacan, Secretary of Socioeconomic Planning, Philippines see the National Economic and Development Authority’s (NEDA) website here. Multidimensional measures help us understand the interconnected factors that constitute people’s experience of poverty, and enable policymakers to identify and address overlapping deprivations more effectively. Data shows that people who are multidimensionally poor are not necessarily income poor. By adopting a multidimensional poverty measure to support the post-2015 development goals, we can incorporate the participatory insights of those living in poverty and ensure we eradicate both multidimensional and income poverty. This event was organised by the German Ministry for Economic Cooperation and Development, CONEVAL of Mexico, the Department for Social Prosperity of Colombia, the Oxford Poverty and Human Development Initiative at the University of Oxford (OPHI) and the new Multidimensional Poverty Peer Network, a global network of policymakers dedicated to advancing the multidimensional measurement of poverty and improving poverty reduction efforts. 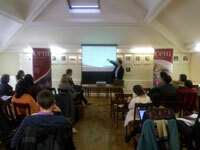 The National Centre for Research Methods (NCRM) organised a two-day training course in Oxford on 13-14 June 2013, ‘An Introduction to the Alkire Foster Method of Measuring Multidimensional Poverty’, which was run by OPHI’s research team. The course provided a conceptual and technical introduction to current literature and techniques of poverty measurement, with a focus on the implementation of the Alkire Foster counting method. This first course provided an idea of the relevance of multidimensional measurement and the intuition behind a local implementation. The programme included a policy-focused sharing session on the international experience, a comprehensive summary of the current state of the art, the methodology, and an intuitive explanation of the implementation process. The course also gave participants the opportunity to design, tailor and calculate a multidimensional poverty measure based on the Alkire Foster methodology. Theoretical lessons were complemented with empirical calculations (in groups). At the end of the course, participants knew the arguments for the relevance of multidimensional poverty measures; understood why and how such measures add value to unidimensional measures and dashboards; and were able to compute Alkire Foster measures and adapt parameters to their own requirements and contexts. The NCRM is part of the Economic and Social Research Council’s (ESRC) strategy to improve the standards of research methods. OPHI will be taking part in a workshop on ‘Inclusive Growth and Poverty in Asia’ in Washington DC, USA, from 3-4 December. The workshop will be held jointly with the Institute for International Economic Policy, George Washington University, and the Asian Development Bank. Participants will include Jeffrey Sachs, Director of the Earth Institute at Colombia University; James Foster, OPHI Research Associate and Professor of Economics and International Affairs at the Elliott School of International Affairs, George Washington University; and Guanghua Wan, Principal Economist at the Asian Development Bank. OPHI staff including Sabina Alkire, José Manuel Roche, Paola Ballon, Mauricio Apablaza and John Hammock will present at the workshop, on topics including ‘Poverty Dynamics and Inclusive Growth in India’, ‘Chronic and transient multidimensional poverty in Indonesia’ and ‘Reducing multidimensional poverty: Inter-temporal analysis in twenty countries’. To mark the launch of a new UNDP Regional Human Development Report for Europe and CIS, “Beyond Transition, Towards Inclusive Societies”, this one-day workshop – which you can watch live online – will bring together researchers, practitioners and other interested parties to discuss multidimensional poverty, social exclusion and human development. Prepared by UNDP’s Regional Office for Europe and CIS, this new report on social exclusion will be the starting point for a broader discussion of how individual countries can use multidimensional methodologies, such as the Multidimensional Poverty Index (MPI) developed by OPHI, to monitor progress. The workshop, organized by UNDP Europe and CIS and OPHI, will take the example of social inclusion to explore possible entry points for individual governments. The morning will focus on conceptual and methodological aspects of multidimensional poverty; the afternoon will address some sector-specific challenges. The first session will set the scene by introducing some recent examples of applications of the MPI methodology. The afternoon session will introduce some specific challenges that are important from a social inclusion perspective. To conclude the day, participants will mark out some next steps and ways the MPI can be adapted to a variety of different contexts. 1. Live streaming: the event will be broadcast live as it happens. To watch, simply visit http://europeandcis.undp.org on the day of the event (20 June 2011, from 9am-6pm BST – detailed timings below). 2. On Twitter: the official hashtag for the event is #sioxford (that stands for social inclusion Oxford, in case you were wondering!). We will be tweeting live from Oxford so you can follow the event real-time and can also use the same hashtag to share your comments and questions. 3. On the UNDP Europe and CIS blog: in the next few days UNDP will begin publishing key data from their new report “Beyond Transition, Towards Inclusive Societies” and will be blogging live from the event. Look at http://bit.ly/lqedSW for a taste of things to come. The Five Missing Dimensions of Poverty Data – why do we need to bring them in (and how)? …. Sabina Alkire, OPHI. Missing Dimensions of Poverty Data – governance and social inclusion. Annie Demirjian, Democratic Governance Practice Leader, UNDP Bratislava. Putting data in context. Using secondary source contextualization for social exclusion monitoring. Andrey Ivanov, Human development Policy Advisor, UNDP Bratislava. Turning data users into data producers: collaborative approaches to statistics. Giulio Quaggiotto, UNDP Bratislava. 13.00-14.00 – Lunchtime Seminar (optional) Multidimensional Poverty in Venezuela during 1997-2000: A proposal for a nationally adapted measure for monitoring purposes. Professor Cesar Gallo, Central University of Venezuela and Jose Manuel Roche, OPHI. Multidimensional poverty monitoring – update on possible applications and country initiatives? Mihail Peleah, UNDP Bratislava.